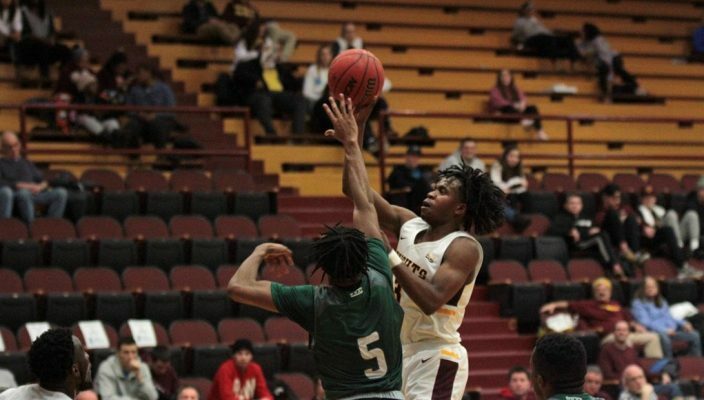 The Gannon University men’s basketball team had an up-and-down week, topping streaking Slippery Rock on Jan. 30 before falling on the road Saturday to the University of Pittsburgh-Johnstown. The split left Gannon 8-13 overall and 6-8 in Pennsylvania State Athletic Conference play going into Wednesday’s 7:30 p.m. meeting with Seton Hill at the Hammermill Center. In the 82-74 win over Slippery Rock at the Hammermill Center, many people wondered whether the Knights could hold up against the red-hot Rock as they were riding a 12-game win streak heading into the contest. Right from the tip off, it appeared as though Gannon would be another victim as SRU quickly jumped out to a 7-2 lead only a few minutes into the opening half. However, made field goals from Kevin Dodds and Daryl Porter, and a triple from Matt Johnson were all Gannon needed to get the wheels turning. As the first half dwindled down, Gannon continued to chip into the lead that Slippery Rock had built early in the game. Defense was a significant factor in this resurgence, with the Knight defenders able to cause turnover after turnover by taking several charges. Scoring contributions from Victor Olawoye, DeAnte Cisero and Kofi Mills sparked a 19-0 run that pushed Gannon into the lead, and the Knights owned a double-digit margin with around 7 minutes left in the first half. Efficient Knight shooting and costly Rock turnovers would lead to a 40-27 Gannon lead at halftime. Coming out of the break, the Gannon offense kept right on rolling with back-to-back layups from Porter giving the Knights their largest lead of the game at 15 points. Around the 13-minute mark, the Rock offense began to get hot. They trimmed the Gannon lead to nine twice in this span, but clutch 3’s from Olawoye stifled what could have been an SRU comeback. The sealing moment came when Slippery Rock was called for a technical foul directly after a foul. Gannon sank all four free throws, stopping all the momentum SRU had to offer. Fouls occurred at a much higher rate than normal throughout the contest. The 54 combined fouls, including 33 in the second half alone, were the most in a Gannon game since a 2015 matchup between the Knights and Edinboro tallied 56. More free throws down the stretch gave Gannon a much-needed cushion in the closing minutes. Keys to victory in this matchup centered on effective shooting percentages from behind the arc. Hitting 7-of-11 from 3-point land, this marks Gannon’s best shooting percentage from deep this season. Porter led Gannon with 22 points while Olawoye added 21 and Cisero 11 to go with 14 rebounds. On Saturday, a major first-half cold spell doomed the Knights in their 76-65 loss to Pitt-Johnstown. Gannon managed just one point during a 10-minute stretch, and Pitt-Johnstown built a 16-point advantage at halftime. The Knights pulled to within 10 points with five minutes to play in the game, but the Mountain Cats held on for the win. Joe Fustine’s 16 points paced Gannon while Cisero added 15 and Olawoye 10 on just 4-of-12 shooting. Gannon was outrebounded 37-26. Following Wednesday’s meeting with Seton Hill, the Knights will host Indiana University of Pennsylvania at 3 p.m. Saturday at the Hammermill Center.